WASHINGTON, DC — TCG is pleased to announce that the company was named the 3rd most adoption-friendly technology company the country, and 28th overall, by the Dave Thomas Foundation for Adoption. This is TCG’s fourth time on the list. TCG began offering adoption assistance to its employees in 2015. The program has more than doubled, now offering employees up to $16,000 for child adoption-related expenses such as legal fees, court costs, adoption agency fees, and travel expenses. The IRS permits employees to allocate up to $13,570 of pre-tax income to a flexible spending account each year to help cover those expenses, and TCG’s assistance program seeds that account. Parents may also take advantage of the company’s other family-friendly benefits, including three weeks’ paid leave for parents with a new child and emergency childcare services. Despite the growth of TCG’s adoption program from $7,500 to $16,000, TCG’s rank among other adoption-friendly workplaces on the Dave Thomas Foundation for Adoption’s list has not changed since last year. This is good news for families, as it shows that companies nationwide are recognizing the important role of adoptive parents and children, and some of the challenges that come with growing a family. According to Aon Hewitt’s 2015 survey of 1,000 US companies, only 12% offered a financial adoption benefit in 1990. By 2015, that number had risen to 56%. “Adoption is an amazing, rewarding experience which can also be costly and time intensive. Adoption benefits help to remove the barriers of affordability and time off work that many adoptive parents face,” said Rita Soronen, president and CEO of the Dave Thomas Foundation for Adoption. 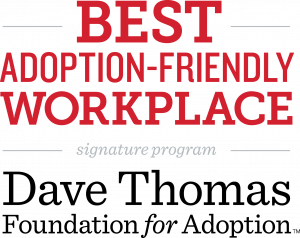 The complete list of adoption-friendly workplaces has been published on the Dave Thomas Foundation for Adoption website.